As in the case of so many troublesome things in Tanzania these days it all began in Zanzibar. Tension between Christians and Muslims is nothing new in Tanzania. 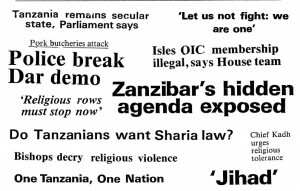 It had been building up for some time but Zanzibar’s unilateral act in joining the ‘organisation of Islamic Conference’ (OIC) without prior consultation with the mainland part of the united Republic created a storm, soon fanned by the very free Tanzanian press, a number of Christian leaders, the Deputy Speaker of the National Assembly, many angry Members of Parliament, and, according to one rumour, at least one Western embassy. Zanzibar’s membership of the OIC was said to have breached the Tanzanian constitution because, firstly, the country is a secular state and should not be part of an international organisation based on religion and, secondly, because it was done unilaterally in what was described as a secretive way. Members of Parliament demanded an enquiry into the matter and a ‘Parliamentary Constitutional and Legal Affairs Committee’ was set up under the Chairmanship of Philip Marmo MP to examine whether the constitution had been breached by Zanzibar’s membership of the OIC and also by President Mwinyi who may have connived in it or at least failed to prevent it. Fire was added to the flames when the 12-person Committee came out with a forceful report, described by some, as one of the most direct results of Tanzania’s new policy of openness and frankness. The report stated that Zanzibar’s membership of the IOC violated articles of the Union constitution and that Zanzibar should be directed to withdraw immediately from the OIC and those responsible for the move (assumed to be the President of Zanzibar and the Chief Minister) should be asked to resign; two other Zanzibar ministers, who had refused to appear before the Committee, should be punished. The report of the Committee said that Zanzibar had been admitted to the OIC only after receiving written assurances from the Tanzanian Embassy in Saudi Arabia but that the assurances given had not been authorised by Dar es Salaam. President Mwinyi, himself a Zanzibari, was not mentioned by name but appeared to be so by implication as he had earlier defended Zanzibar’s action by arguing that the OIC was not an organisation of Islamic states; many of its African members had Christian Presidents (e.g. : Uganda, Cameroon, Guinea, Burkina Faso) and some even had Christian majorities in the population. But the Marmo report said that the issue was not ambiguous – foreign affairs was under the jurisdiction of the union Government. In the meantime, the Supreme Council of Tanzania Muslims, ‘Baraza Kuu la Waislamu Tanzania’ (BAKWATA) filed a petition with the National Assembly requesting the MP’s also to investigate the long standing diplomatic relations between Tanzania and the Vatican. 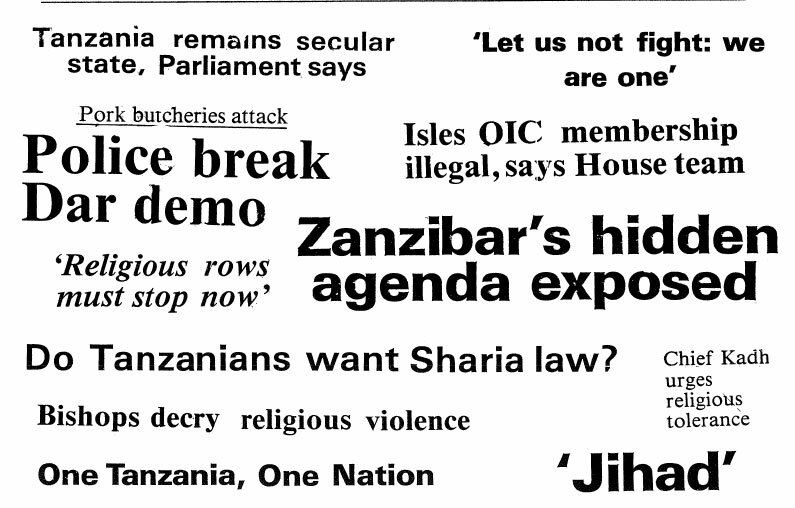 The Family Mirror then quoted the Daily News as having said that in Dar es Salaam seditious preachings, masterminded by Muslim fundamentalists, were urging Muslims to prepare for ‘Jihad’ (religious war) and were advising Muslims to burn CCM (the ruling Party) membership cards and to vote for a Muslim President in the 1995 general elections. Cassettes criticising Christians were said to be circulating in Dar es Salaam. There followed responses from Christian groups. Reacting to a statement from the Catholic Church (supported by the Evangelical Lutheran Church) whose bishops had complained about government inaction when certain groups were ‘openly moving around preaching contempt and blasphemy against the Christian faith’, President Mwinyi summoned Christian bishops to State House for consultations. He promised to react to their concerns. The Tanzania Episcopal Conference had also earlier criticised the government for its silence in the face of ‘continued scandalisation of the Christian faith’. Meanwhile, the long standing dispute between the splinter group (Bulletin No 42 of May 1992) Mount Meru Diocese of the Evangelical Lutheran Church of Tanzania (claiming 84,000 followers) was declaring that its adversary, the Meru Diocese (which it claimed had only 2,500 followers) was ‘an ice block which would melt in the sun’ according to the Family Mirror (January 1993 Issue). The Lutheran bishops have been opposing strongly the establishment of the breakaway Mount Meru Diocese and strenuous efforts have been made to bring about reconciliation. The government felt it necessary to intervene: Minister of Home Affairs and (now) Deputy Prime Minister Augustine Mrema held meetings throughout Meru and said that everyone wanted to have only one diocese. Unless the people of Meru made it clear that they wanted more than one, the government would enforce an agreement which had been reached between the 19 Lutheran parishes in Meru. An indication that the problem had not been resolved, however, was the reported arrest of 18 people, two of whom had been been convicted in connection with violence related to the issue. A similar religious dispute has been reported from Kyela where 22 persons have been arrested on a charge of attempted murder related to a religious conflict in the Moravian Church. The accused are alleged to have set fire to nine houses as part of their demand for a diocese separate from the Rungwe headquarters of the church. Adding to the religious ferment in Dar es Salaam has been the visit of the German Pentecostal Evangelist Reinhardt Bonnke who, according to the BBC, which intends to present a television documentary about him later this year, attracted a crowd of 100,000 people during his Dar es Salaam crusade. 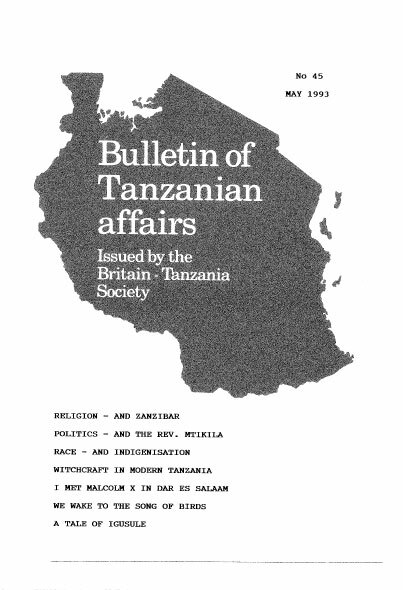 In February the Business Times reported that representatives of various faiths – Hindu, Muslim, Christian, Bahai (which sponsored the gathering) and Zoroastrian had come together in Dar es Salaam and proposed the setting up of an ‘Inter-Religious Association (IRA) to promote fellowship amongst different religions. After all they, agreed, ‘all people worship and believe in God as the universal creator; all believe in the brotherhood of man: every religion teaches a code of ethics and moral values’. However, angry religious expression amongst a small group in Dar es Salaam continued. The next event was on April 9th when a group of Muslim fundamentalists stoned and demolished three pork butcheries in Dar es Salaam. Thirteen people were subsequently arrested and Deputy Prime Minister Mrema said that the attacks had been the work of a group of externally financed persons. Another 13 people were arrested during a protest march about the arrest of their colleagues. The protesters were carrying a red and white flag with the slogan ‘Muslims are ready to die in defence of their fellow Muslims. Help us God’. A few days later Sheikh Yahya Hussein, leader of the extremist Koran Reading Development Council (BALUKTA), who had admitted that the people who had destroyed the butcheries were his followers, was also detained. Chief Sheikh Hemed bin Juma bin Hemed and the Muslim Council of Tanzania (BAKWATA) gave their full support to the government’s action saying that Tanzania was a secular state: they advised Muslims to maintain peace and stability. Tension increased further on April 22nd when police used tear gas to disperse about 100 people trying to make their way to the courtroom where now 36 Muslims were being charged with illegal demonstration and destruction of property. They were refused bail. As this Bulletin goes to press the Daily News (April 29 1993) reported that the Government had struck BALUKTA off the Register of Religious Societies for engaging in activities other than those for which it was registered. Minister of Home Affairs Augustine Mrema, addressing a meeting of religious leaders at the Diamond Jubilee Hall, said that since 1988 BALUKTA had been undertaking activities such as marriages which were the responsibility of BAKWATA. Mr Mrema called on BAKWATA to set up its own Koran reading section to replace that of BALUKTA. He also said that anyone in possession of seditious tapes recorded by BALUKTA should surrender them or face prosecution. In future, the Minister said, any religious sect wanting to be registered would have to have the blessing of BAKWATA for Muslims and the Christian Council of Tanzania (CCT) for Christians. The meeting ended with religious leaders present shaking hands. However, several Muslim fundamentalists refused outright to shake hands with anyone including their fellow Muslims. The Marmo Report was found unacceptable in Zanzibar and so Tanzania was plunged into a situation which brought into focus the constitution itself and its seemingly increasing ambiguities. Professor Issa Shivji, writing in Africa Events (March 1993) questioned whether the constitution – and in particular the increasing numbers of items which have been added to the list of matters reserved to the Union Government over the years (for example, foreign exchange), was itself lawful. ‘The OIC membership, which is presumably a matter concerning external affairs and is therefore a Union matter cannot be treated in isolation from the basic issue of distribution of power which lies at the core of the problem of the Union’ he wrote. Pointing out that every time anyone had tried to question the official interpretation and structure of the Union such opposition had been stifled, he quoted three cases in support of his contention the case of the former President of Zanzibar, Aboud Jumbe, who was ‘ignominiously booted out in 1984 for raising the issue’; the Nyalali Commission’s recommendation for the creation of three states (the mainland, Zanzibar and the Union instead of the present two) which had been ‘brushed aside’; and, the issue of the vice-Presidency of the Union which had been postponed at the last session of the National Assembly (Bulletin No 44). I At the end of the day’ he wrote, ‘the disease is in the very heart of the body of the Union. The rest (including the IOC issue) are all symptoms. Whether we like it or not, history has objectively placed a new constitutional order on the agenda. The longer we resist it the more the damage to our social fabric and political stability’. Zanzibar President Salmin Amour stated that Zanzibar had joined the IOC for economic and social gains because the organisation offered interest-free loans unlike the World Bank and IMF. He urged MP’s to assess the Union bearing in mind that unity of any kind required not only goodwill but also resolve to uphold its tenets. “There were areas where we went wrong” he said “and areas where we did well”. There were differences among people but “man excels when he wisely looks for solutions”. The party which is believed to represent the main opposition to the CCM in Zanzibar had three of its top leaders briefly arrested on February 10th; they had their luggage searched. According to the Business Times, the Police seized two empty cartridges of bullets said to have been used in a Police shoot out of CUF members in Pemba early in February in which it was said that one person had been killed and a few others injured. The Police were said to have immediately appointed a probe team and suspended 11 policemen. Another extreme element in the political-religious situation in Tanzania is the Rev. Christopher Mtikila, head of the ‘Full Salvation Church’ and Chairman of the as yet unrecognised Democratic Party who is openly advocating the break-up of the Union. He has vowed not even to seek the 400 sponsors from Zanzibar needed if his party is to be registered. After a speech in Dar es Salaam in January, a group of his supporters apparently caused a breach of the peace and paramilitary forces had to be brought in to keep order. Mtikila was subsequently arrested and charged with unlawful assembly, breach of the peace and uS1ng abusive language against CCM leaders and the Government (on January 28th in Dar es Salaam). It was alleged in Court that his speech had stirred his followers into rioting and attacking people of Asian origin; many people were injured and some lost property. During the first stage of the court case Asian shopkeeper Almoonir Jiwa (22) said that he had had to have six stitches on his face after being attacked. A Police Officer told the packed courtroom that Mtikila had told the rally that President Mwinyi was a thief, Tanganyika had been sold to the Arabs and Indians, that its wealth was under the control of 161 people he termed ‘gabacholis’ and that it was time to dismantle the Union and declare the liberation of Tanganyika. The case against the Rev Mtikila was subsequently dismissed apparently on the grounds (amongst others) that stating that President Mwinyi and Mama Sitti were thieves was merely a figure of speech meant to attract political sympathy. The verdict seems to have raised eyebrows in legal circles in Dar es Salaam. Three opposition parties – CHADEMA, the National League for Democracy (NLD) and the Tanzania Peoples Party (TPP) plan a merger to form a powerful opposition against the CCM. Meanwhile, another party has fallen into disorder. Its Chairman Chief Fundikira, has attempted to dismiss the Secretary General, Ambassador Tumbo, and his executive committee and to appoint a ‘task force’ to run party activities – a move described by Mr Tumbo as unconstitutional. Considerable interest was directed towards Kwahani in Zanzibar in April as the first by-election to be held in Tanzania since multi-party politics were introduced approached. The former MP had been killed in a road accident. The opposition parties reached what they described as a gentleman’s agreement to boycott the by-election, claiming that conditions in Zanzibar were not conducive for the holding of a free and fair election. However, the Tanzania Peoples Party (TPP) later decided to break ranks and fielded a candidate against the CCM. According to the Business Times the registration of voters went smoothly and campaign rallies met with broad satisfaction. But only the civic United Front (CUF) was thought to be able to provide serious opposition to the ruling party (CCM) and it had decided to boycott the election. The TPP candidate walked out of the Hall during the vote count complaining of election irregularities. He was advised to petition through the normal channels and is expected to do so. The Daily News hailed the result and wrote that the people of Kwahani had shown the rest of the country the way to manage an election in a multi-party system. ‘It should be a great inspiration to Tanzania and a demonstration to the rest of the world that we are masters of our own destiny. The turnout of 2,951 voters out of 3,327 registered is impressive by any standards anywhere. All we need is discipline, tolerance, respect for the law, fair play and acceptance of the ultimate results’. The issue of indigenisation – favouring greater African participation in Tanzania’s economy (Bulletin No 44) – has not gone away. Advocates of indigenisation claim that, although Asians number only 200,000 they control 30% of commercial businesses and indigenous Africans control only 3%. The state still has over 60%. Demands for indigenisation are all the fault of the IMF according to former Minister Abdu1rahman Mohammed Babu, quoted in the Business Times during a visit to Tanzania for a meeting of his International Institute for Human Rights. Babu castigated political leaders who subscribed to parochial ideas and models like indigenisation saying they were out to wreck the nation. 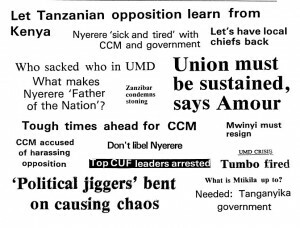 Specifying Christopher Mtiki1a’s ‘gabacholi’ political model, which suggests that Asians are the exploiters and black Tanzanians the exploited, Babu said that the model was aimed at sidetracking the real issue facing Tanzania “which is Imperialism”. He said that Tanzania belonged to all people who lived in it. 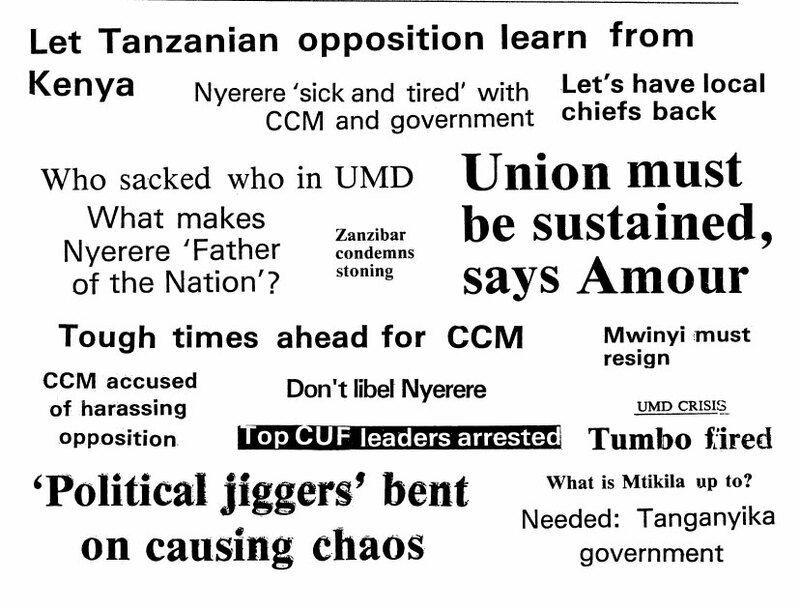 Not at all, hinted ‘annoyed citizen’ in the Business Times (February 12): it was Mwalimu Nyerere who was responsible. ‘He brought about the Arusha Declaration and the Leadership Code which resulted in the business field being left entirely in the hands of Indians’. USAID representatives in Tanzania have indicated their concern at the recent turn of events. They said that ownership of an enterprise did not matter as long as the investor paid his taxes in Tanzania, employed Tanzanians and earned foreign exchange for Tanzania. They warned that the competition for capital in today’s world was very keen. Investors could invest in Tanzania or some place else. As if to emphasise the problem, the Canadian International Development Agency announced on March 4th that Tanzania was among eight African countries which had been dropped form the list of recipients of Canadian aid because of financial problems in Canada. A week later Sweden announced that it too was cutting its aid by 10% because of its unprecedented economic crisis and because ‘it was time for developing countries to stand on their own feet’. But Norway has indicated that it intends to maintain its level of development financing to Tanzania largely for economic development. By contrast, the European Commission has announced a change of direction in its aid to concentrate more emphasis in future on the social rather than the economic sector. There would be no cut in the amount. Mwalimu Nyerere himself has consistently dismissed the indigenisation campaign as a camouflage by a small elite of African capitalists to cheat the Tanzanian masses by purchasing formerly state owned parastatals, which the people helped to build up, at rock bottom prices. He said that if Tanzanians begin to discriminate against non-indigenous Tanzanians what would there be to prevent further discrimination between for example, the Gogo and Chagga Editor. In September 1992, the African Studies Association of the United Kingdom held a conference on the theme of Order and Disorder in Africa at the University of Stirling. I organised and chaired a “panel” on the theme of witchcraft in contemporary Tanzania, and I report briefly on this on the invitation of the Editor of the Bulletin. Three papers were presented and were well received. One paper, on “witch killings in Sukumaland” by Simeon Mesaki of the University of Dar es Salaam, was summarised from the chair because the author himself was unable to attend. The other papers, on “Witches, Witchcraft and the Question of Order: a view from a Bena village” by Solomon Mombeshora of the University of Cambridge and on “Shaving Witchcraft in Ulunga” by Maia Green of the London School of Economics, were presented by the researchers themselves. All three authors are doctoral candidates in anthropology and have a close knowledge of the areas they discuss. It is intended to put the articles together into a small book, along with one or two other papers on related themes, and it is hoped that the volume will be published by the Cambridge University Centre of African Studies in a similar format to my earlier edited book on Villagers, Villages and the state in Modern Tanzania, (1985). Witchcraft in contemporary Tanzania presents several practical and intellectual problems. As in many other parts of modern Africa, beliefs in the power of individuals to harm each other mystically or magically are still widespread there, in both urban and rural communities, and there is little if any sign that they are disappearing. Because such beliefs have largely, though by no means wholly, lost their force in many parts of Europe, it is often assumed that they will also fade away elsewhere, but this may be an unwarranted and ethnocentric assumption. Moreover, there is certainly no shortage of other, at least equally “unscientific” beliefs in Europe about intrinsic qualities of evil within human beings, as the horrors of so-called “ethnic cleansing” and panics about “satanic abuse” to take two extreme examples patently and at times tragically reveal. It seems clear that most of the villagers discussed in the conference papers consider witchcraft to be a dangerous reality which they would like to see controlled and, if possible, eradicated. There is, however, evidence of substantial temporal and local variation in the degree of general concern involved, and in the methods adopted to deal with the problem, though the documentation of such variation is sometimes difficult. The issue of methods of attempted control is the most straightforward. There are sharp differences, for example, between Pogoro (in Ulanga) and Sukuma patterns in this context. Pogoro have developed peaceful forms of purification which involve both suspected witches and their accusers visiting a ritual expert and having their hair ritually shaven. Among the Sukuma, on the other hand, there has been a worrying tendency to resort to violence against suspects. This has resulted in a number expulsions and even murders of suspected witches, and in the flight of many suspects, who are usually old women, from their villages into the towns. Some such women have subsequently been resettled elsewhere. Not surprisingly the Government has been very anxious about this development. In the Bena area of Njombe District studied by Mombeshora, there is also some evidence of a resort to violence, but this seems to be on a substantially lesser scale than among the Sukuma. A historical perspective on these practices seems useful. Public accusations of witchcraft and violent retribution against suspects were strongly discouraged under the colonial regime, which was often thought of as protecting witches, and different ways of dealing with the problem developed in many areas. Witch finding movements such as Mchapi in the 1930s spread north from Zambia, and reappeared in some parts of Tanzania in the 1960s (Willis, 1968). Some suspected witches were expelled from their communities, and many of those who felt themselves at risk from witches moved elsewhere (cf. Abrahams 1981). A spate of witch killing emerged among the Sukuma in the early 1960s, and there is evidence to suggest that some hotheaded villagers mistakenly believed that the newly independent government would approve of such behaviour (Tanner 1970). There seem also to have been many murders in the 1970s and 1980s. A further element in the situation appears to have been the villagisation “operations”. There is a great deal of comparative material which suggests that people’s anxieties about witchcraft increase when they are forced to live in close proximity to each other, and many Nyamwezi villagers expressed fears about this to me in 1974-5. Some of the comparative evidence on this issue, in Tanzania and elsewhere, goes back well beyond this period to the days of colonial sleeping sickness settlements. Indeed, the modern, peaceful pattern in Ulunga partly harks back to measures adopted during such colonial population movement, although its cultural roots go back beyond this also. Another complicating element in the Sukuma area has been the development of Sungusungu “vigilante” groups (Abrahams 1987 and Abrahams and Bukura 1992). These grass-roots groups began to operate in part of the Nyamwezi/Sukuma area in the early 1980’s, and they spread very rapidly to other parts of the area and beyond. They were aimed at raising the prevailing levels of law and order in the rural areas, and the control of cattle theft was the main focus of their activities. Some groups, however, also directed their attention against witchcraft, which they saw as a serious threat to rural security . It is not clear to what extent these groups and their leaders have affected the situation beyond providing an institutional forum for the expression of anxieties about witchcraft. Nor, more generally, is it clear exactly how many suspected witches have been murdered among the Sukuma. Available statistics are hard to interpret, and I suspect that many of the figures quoted are too high. Nevertheless, it is clear that there has been a serious problem, and that the pattern of recent reaction to suspicions of witchcraft has been much more violent among the Sukuma than among the Ulanga Pogoro. There are many paradoxes in the contemporary situation, and some of these are interestingly highlighted by Mombeshora’ s paper on the Bena. He shows how structural conflicts between senior and junior generations have been exacerbated by the emergence of new development-oriented attitudes and institutions, and by new possibilities for younger people to seek economic and religious independence from their elders. This leads the young to question both the wisdom and authority of their seniors, who in turn try harder to assert that authority through warnings of mystical punishment, which are in turn read as witchcraft threats by those at whom they are directed. In earlier days, such threats probably appeared more legitimate, and those so threatened could relatively easily move away to a safe distance if they wished, but population increase and modern controls over movement have inhibited the possibilities of doing this. It remains to be seen whether recent reforms and relaxation of controls on settlement and economic enterprise in Tanzanian villages will help or hinder the resolution of these problems. The greater freedom of individuals to choose where they live may once again permit them to establish ‘safety zones’ between themselves and others, but it is also possible that this will be offset by increased jealousies and suspicions arising from further economic differentiation between richer and poorer sections of the population. Abrahams, R G and Bukurura, S. Party, Bureaucracy and GrassRoots Initiatives in a socialist state: the case of Sungusungu vigilantes in Tanzania’, in C Hann (ed) Socialism: Ideals, Ideologies and Local Practices. Routledge. 1992. Willis, R. ‘Kamcape: An Anti-sorcery Movement in Southwest Tanzania’. Africa. 1968. Tanzania has benefited from a number of donor assisted highway projects over the years many of which provided fast smooth roads which then disintegrated because too little was done to maintain them; many were broken up by over-loaded lorries. The World Bank estimated that Tanzania was spending up to US$ 150 million annually (one third of total export earnings) on vehicle operation due to the bad roads. Tanzania therefore launched in 1991 a much more ambitious programme than any that had gone before the 5-year Integrated Roads Project (IPR) for which World Bank and other donors are contributing 90% of the total cost of US$ 901 million. Under this project it is intended to improve 34,650 kms of Tanzania’s 55,000 kms of roads to ‘all weather, maintainable standards’: 10,150 kms will be trunk roads (only 10% of which were regarded as satisfactory in 1991) and the remainder rural roads. The IRP will also decentralise the Ministry of Works to enable it to cope better with maintenance and hopes to introduce a new’ road maintenance culture’. There will be a ‘no pothole policy’ aimed at repairing faults before they damage the road foundations and new methods are being introduced such as grinding up old Tarmac and using it again. The target is to have 70% of the trunk roads and 50% of key regional roads in good condition by 1996. Work began in mid-1991. The Chinese are building the 226 km Tunduma-Sumbawanga road giving better access to the maize-rich Rukwa region: local firms are rebuilding the 310 km Bereku-Singida- Shelui and the 278 km Usagara-Lusahanga roads. other components of the project include a 58 km section of the Tanzania-Zambia highway from Igawa to Igurusi which is assigned to a British company (stirling), the Dar es Salaam-Kagera corridor via Oodoma and Mwanza with a branch to Tabora: and a design study of a new road from Tabora to Kigoma. In Morogoro Region, in the interests of austerity and greater permanence, local ‘petty contractors’ from the villages are repairing short lengths of minor routes, and tracks for oxen, donkeys and horses using hand labour. The roads in and around Dar es Salaam are a special problem which is being tackled by the Japanese. When I was last in Tanzania I was shocked by the number of private cars, especially the host of new ones bearing the ‘TX’ number plates (formerly used for duty-free vehicles) many belonging to aid agencies. Perhaps too much is being spent by donors on these cars and other creature comforts. I think it would be a good thing if development could be drawn away from Dar es Salaam which is creating part of the problem by being so insatiable for supplies from afar. I visited Dodoma in 1991 and it was clear to the officials I met that even they did not agree on where they would be able to find enough water to support the town as a capital city. I think that Tanzania would be better served if there were a number of prosperous and fairly self-sufficient regional centres and market towns rather than one huge megalopolis on the coast. It was during his second extended visit to Africa. It was a Quaker friend, an Afro-American, who told me that Malcolm X would visit Dar es Salaam and urged me to meet him. To what end I asked? I then told Bill about my first encounter with Malcolm X, at a United Nations reception in New York a year or so earlier. There, Malcolm X had been unyielding: there was no way that he would use his considerable leadership skills to involve whites as well as blacks in the struggle against injustice. In his world scenario there were no positive roles for whites. Given that experience, was there anything further for me to discuss with Mr X? My friend was not put off. Malcolm had been transformed at Mecca, he said. I would profit personally from exchanging views with him, and Malcolm himself would gain from meeting not just Africans and black Americans but people like me, white Americans working in Africa with Africans. Later that day I headed for a phone booth on the verandah of the old New Africa Hotel. The phone was being used. Occupied by whom? Malcolm X hung up, smiled, introduced himself. Some four hours later, we finished talking. Malcolm X told me how his hadj – his pilgrimage to Mecca – had transformed him, and how his conversations with African leaders like Julius Nyerere and Jomo Kenyatta had enriched him. The two neighbouring countries had had widely disparate colonial histories, and, consequently, starkly different independence struggles: Tanzania’s was a triumph of reason, Kenya’s a revolution. Malcolm X appreciated Nyerere’s perspective that his country’s argument with the former colonial master was with the British government, not with the British people. And he was aware of Kenyatta’ s capacity to come to an understanding with Kenya’s white settler farmers, and gain their great respect. Malcolm marvelled most that both presidents were free of racial animosity. Now, despite our earlier encounter, I could see not a trace of racism remaining in Malcolm X. The impact of Mecca and of his meetings with African leaders, enhanced by his unique ability to assimilate ideas and viewpoints, was profound. Something else had happened. He began to see his struggle for justice as reaching past the issues of American civil rights to that of global human rights. I have never, before or since, met a person with so incisive a mind or so great a capacity to ask probing questions and to learn what moved people. Responding to his questions, I explained that this was my third year in Africa and that I was there out of concern for justice and fairness that were planted in me by my parents, my educators and my Christian faith. I was not to see Malcolm X again: just weeks later he was assassinated. Still, from that one meeting I knew that, at the end of his life, Malcolm wanted all of us to join in making the world a better place, more human and more humane, and that he was in a hurry. In the north west of Nzega district there is a village called Igusule where, sometime in May ’91, I found myself in the process of organlslng a village seminar. I would be meeting with my friend, the village Extension Officer, at the cattle crush which can be found in the forest along Igusule’s southern edge. When I found Gordons he was busy vaccinating cattle; there were only some thirty or forty head, but since this is Tanzania, where nothing is simple, it turned out to be tremendously hard work. The cattle crush was in an extremely sad state of repair, so much so, that rather than aiding Gordons with his work it was in fact inhibiting him. Let me explain by using a small metaphor; the water funnel; the mob of cattle enter at the wide mouth of the funnel and, as they progress inwards they are eventually reduced to a single file procession; at this point, as they pass Gordons one by one, he vaccinates them. That, anyhow, is the theory. In practice it worked out like this … so many cattle had passed through the crush that by the time they had come to a single file they had worn a deep trench into the ground. By now the trench was so deep that the cattle could no longer keep their heads and horns above the latticed steel bars that formed the crush’s frame. As soon as a cow would enter the single file area its horns would become entangled in the steel frame and it would panic, thrashing its head from side to side and sometimes bucking and kicking, so that its compatriots behind would decide unanimously to retreat. Unfortunately, that sensible option was no longer available to them, for not only had the funnel mouth been long since closed, but also, there was the presence of several enthusiastic youths armed with long flexible sticks. These drivers had their own goal and that was to force the cattle down the funnel so that Gordons could do his work. By rushing about wildly, gesticulating and yelling, the boys encouraged the miserable cattle to congregate in the narrow end of the funnel. This was bad enough but, occasionally, a lone and foolish cow, panic stricken by the confusion in the front ranks of its fellows, would break through the cordon of youths thereby provoking them into terrifying action. I stared amazed as another cow broke free from the bovine melee and attempted to rush the stockade frame. Two youths left the cordon and neatly out-manoeuvred the hapless escapee who then received several lightning quick blows with the sticks right between the eyes. Such alarming treatment was enough to persuade the cow that the unknown dangers of the narrow path were preferable to those presented by these horrendous demons with the awful sticks. The cow would dive back into the safety of its own kind thus further encouraging the general forwards motion. All these cattle were the property of one man who stood to the side quietly leaning on his long staff. I asked him how many cattle he owned and he answered by indicating the scene in front of us, replying, “Only thirty to forty”. In fact he was currently the owner of around eight hundred head, and that wasn’t including the many goats and sheep he undoubtedly had as well. He had not always been a rancher; only two years ago he’d been a successful businessmen in Shinyanga owning two buses and a few other smaller vehicles. One day he had sold them – all bar one – and moved back to the village to keep cattle. By now the youths had valiantly forced the cattle past Gordons’ vaccinating gun, but for the beasts the ordeal was still far from over. Once out of the first single file passage the cattle would emerge into another stockade with another funnel, this time followed by the need to leap into the dipping pit. But the passage, having suffered the passing of countless thousands of hooves, had had a deep trench worn into its bottom. The boys were now covered from head to foot with wet green cow manure and were using the sticks so often that the weapons would fragment and shatter until all they had left was not much more than they were grasping in their hands. In the end it was worth the effort; the cattle had been dipped and vaccinated so were now fit for transportation and to be sold. The cattle owner, who went by the name of Mzee Balole, invited Gordons and I back to his house to eat, which, I might add, I refused. His house was typical of Igusule and other villages of his district in that it was surrounded by his cattle corrals and therefore, as far as I was concerned anyway, was plagued by the millions of insect followers that African cattle inevitably attract. Besides, when I’d arrived in the morning I’d expected to have more of Gordons’ time and so I was already lacking in patience. We did go to Mzee Balole’s house. We stayed and drank some sour milk. But lunch was going to be a long time coming and eventually my patience plus my inability to deal with the flies forced me to drag Gordons away from a free meal. Nobody else noticed the flies, not even Gordons who is from Mount Kilimanjaro where this kind of cattle culture doesn’t exist. Should one or more of the insects happen to investigate a particularly sensitive orifice or organ, it was calmly wafted away like the useless and poor excuse for an irritation it was. When I had left the homestead I knew I had committed an unforgivable social faux-pas and I became depressed, so Gordons tried to cheer me up by telling me a few tales of the bush. Like myself, Gordons had a passionate interest in all things to do with the wild and, having lived in Tabora region for some years, he was capable of telling the most incredible stories. To begin with he tells me that some of the villagers here still manage to hunt in the forests that lie to the south. Unfortunately for the wildlife, Igusule is a large village and so most of the bigger game have been forced deeper into the woods; the last lions here were poisoned as far back as 1971. The one notable exception though was the magnificent and secretive Greater Kudu whose meat is regarded as especially sweet by many Tanzanians; an adult bull male may weigh in at over three hundred kilogrammes and has, mounted into his skull, two spectacular spiralling horns. However, though its exceptionally shy nature means that even a large adult male would rather run whenever threatened it must still be quite a handful to kill, so I remarked on that to Gordons. “No” he replied, “if you have a torch and you hunt at night it is really very easy. Many people have rifles in this village”. This was definitely news to me and I said so. “Yes” said Gordons, “we use this local rifle, the one where you load the ammunition and the gunpowder in the muzzle” and he offered to show me one when we got back to his house. When I saw it I was taken aback. In its dark wooden stock there were inlays of bright metal, and perhaps ivory too, fashioned into subtle Arabic shapes and signs; it had a long barrel braced its entire length with the wood of the stock and slung below was the ramrod that confirmed for my disbelieving eyes that it was indeed a muzzle loader. I took it from Gordons to examine it. I was sure that it could be ancient so I asked Gordons if he knew its age, “Oh yes I think maybe, fifteen years” he replied. Gordons really knew how to surprise me and having so gained my attention he began to tell me more about the rifle. Some eighty or a hundred miles south east of here there is an extremely large and wild tract of bush where lives a secret society of rifle makers. So secret are they that, should an unwelcome stranger happen to stumble upon them, they might well murder him in order to protect the secret. The raw material used in the manufacture of the rifle barrel is the steering rod of a car which, I believe, is somehow either cold or slow drilled through its entire length to form the business end of the muzzle loading musket. Should you wish for something more up market, you could go for one of their .404 hunting rifles, “the one they use to kill the elephants” Gordons tells me. Even the gunpowder for the musket is made by these experts. The shot on the other hand, is readily available in most big towns and comes in the form of standard sized solid, round steel bars known as ‘Nondo’; these are sawn up into suitably sized plugs of maybe one centimetre thickness that fit surprisingly well down the barrel of the musket. I couldn’t say what calibre the muskets were but the muzzle looked very wide. My imagination began to run amuck as I thought about the packing of the barrel with powder and then plugging it with that formidable steel shot. Pulling the trigger must have produced the most sensational results. Gordons went out again and a short while later came back. This time he had some local ‘baruti’, or gunpowder, with him. “Watch” he said. “It works very well”. He poured a measure onto the floor, and then he touched a match to it and with a brief violent orange flash it flared explosively and died. My retinas were left with the impression of its brilliant signature. But I remained in doubt as to whether these locally produced items were really capable of performing their intended task. “Even shot like this kills elephants very nicely” Gordons solemnly assured me, rather unnecessarily I thought. I couldn’t imagine that it would be very accurate, but firing it must have been somewhat akin to loosing off an old siege cannon, and woe betide any being luckless enough to interrupt the passage of that formidable plug of steel. By the time we had conducted our business of the day I had toured much of Igusule, meeting and talking with some of the farmers. Gordons had also taken me to the market to meet a few of the stall holders. Igusule was going to be a boom town. The railway from Dar es Salaam came right through as did the fabled African trams-continental highway. In the future they were going to build at Igusule a new railway cargo terminus, with a new line going north to Bukoba starting right there. Blessed of all, the Tarmac part of the highway, beginning in Kigali, Rwanda, would be extended all the way to Igusule. Change was coming and Igusule was going to be a different place. The Department of Research and Training (DRT) in the Ministry of Agriculture has recently prepared a comprehensive new Research Plan. This Plan has been developed to ensure that Tanzania’s limited resources are focused on the most important technical problems constraining agricultural production. The Plan was developed with the financial assistance of Germany, the Netherlands, and the united Kingdom and the professional assistance of the International Service for National Agricultural Research (ISNAR). The plan was completed in 1991. The Research Masterplan was launched by the Government of Tanzania during a Workshop held in the Kilimanjaro Hotel, Dar es Salaam in March 1992. This launching was effected with the help of the Special Program for African Agricultural Research (SPARR). SPAAR was established in 1985 by 23 donor members to strengthen African agricultural research systems through the launching and start-up of a collaborative plan of priority agricultural research. The Government has established a Consultation Group with its donor representatives in Dar es Salaam. This Group is called regularly into session by the DRT to discuss implementation plans and financing needs. The Department of Research and Training are now putting the finishing touches to their detailed commodity research programme plans, to their plans for using some of the surplus research stations for alternative purposes and to the redeployment of some scientific and support staff from low to high priority research stations. Tanzania is fortunate to have one of the largest and best-trained teams in Africa (more than 350 graduates with over 10% holding a doctorate degree). There is a new mood of optimism and enthusiasm in the air at Temeke (the old headquarters of the Tanzania Livestock Research organisation and now DRT’s HQ near Dar es Salaam) and one can anticipate that this new consolidation and focus of effort will pay dividends in the years to come. However, this new enthusiasm is likely to be difficult to sustain without rapid action by Government to reform its civil service with significant improvement of salaries and rewards for exceptional work. At present, Tanzanian scientists, including those with PhD and many years experience are paid little more than an attendance fee, needing to supplement their salaries with other work. No useful agricultural research system can ever function with part-time scientists. The long-awaited reform is coming but maybe not in time to stop the emigration of those who can find an incentive salary elsewhere. This new initiative by Tanzania to consolidate the support of its donor community (about 16 SPAAR members now finance research in Tanzania) behind its new Research Plan is exciting and should help Tanzania develop its agricultural production with resulting benefits all round of greater food security and more foreign exchange earned. We came back to Tanzania in October 1991 and again are very happy here. We live at Mafiga, Morogoro, where we have a lovely old house (formerly a sisal farmhouse) and large garden: from our verandah we can see the steep Uluguru Mountains and the view from the back is dominated by another range, Mindu. The garden is a naturalist’s paradise: it contains a wonderful range of tropical plants – many of which provide us with our own fruit – and abounds in birds, reptiles and invertebrates. The bird life is particularly impressive. We awake each day to the songs of white-browed robin chats (Cossypha heuglini), spotted morning warblers (Cichladusa guttata) and yellowvented bulbuls (Pycnotatus barbatus). Pied crows (Corvus albus) and white-naped ravens (Corvus albicoll is) come and drink from the water bowls that we have put out in the garden, as do balck-headed weavers (Ploceus cucullatus) and, from time to time, other birds such as bronze mannikins (Lonchura cucullata) and blue-capped cordon bleu (Uraeginthus cyanocephalus). Scarlet-chested sunbirds (Nectarinia senegalensis) and variable sunbirds (N. venusta), feed from the flowers in the garden and little beeeaters (Merops pusillus) hunt insects. African yellow-billed kites (Mil vus migrans parasitus) often frequent our trees by day – there is also a large roost, mixed with the European race, only a few kms away – while barn owls (Tyto alba) hunt in the garden at night. Bateleur eagles (Terathopius ecaudatus) regularly soar overhead and cattle egrets (Bubulcus ibis) pass over morning and evening. Reptiles are also prevalent. There are striped skunks (Mabuya striata) and house geckos (Hemidactylus mabouia) everywhere but we also see yellow-headed dwarf geckos (Lygodactylus luteopicturatus), chameleons (Chamaeloe sp.) and Nile monitors (Varanus niloticus). The commonest snakes appear to be the white-lipped or herald snake (Crotaphopheltis hotamboeia) which is rear-fanged and the tiny blind snake (Typhlops sp.) which is harmless. spitting cobras (Naja nigricollis) visit us from time-to-time and there is at least one green bush snake (Philothamnus sp.) in the bushes overhanging our outhouses. Puff adders (Bi tis arietans) are frequently reported by our Tanzanian neighbours and we are often called to remove them. The invertebrates we see deserve a multivolume text to themselves. The most spectacular are the butterflies such as the mocker swallowtail (Papilio dardanus), citrus swallowtail (P. demodocus), African monarch (Danaus chrysippus), commodores (Precis spp.) and, especially after rain, grass yellows (Eurema spp.) which provide us with a far better spectacle than any butterfly house in Britain! Large wasps, bees, grasshoppers, mantids and beetles are ubiquitous and not proving easy to identify. Giant millipedes appear when it rains as do giant land snails (Achatina sp. ), ant lions and termites. We have a large collection of captive animals – some “permanent”, some temporarily with us while undergoing veterinary treatment and others in transit for only a few days. At present we have two dogs, four guinea fowl, two chickens (one the local Kuchi breed which has a bare neck),four pigeons, an Indian house crow, eleven rescued tortoises (of two species), an African rock python and various insects. other species which have passed through our hands have ranged from freshwater crabs to young ostriches.